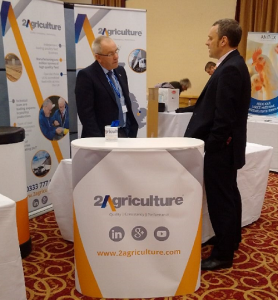 On Tuesday 1st March 2016, David Montgomerie, Commercial Manager, and Alistair Miller, Sales Manager, attended The Northern Broiler Conference at Cedar Court Hotel in Bradford. The conference was well attended and both David and Alistair found the presentations to be interesting, varied and commercially relevant. With the importance of innovation and collaboration within the broiler industry being the common theme throughout the day, the conference was begun with Dave Heckman of Elanco. Ben Huntington, Faccenda, then spoke about how to reduce Campylobacter in agricultural production methods, and Sophie Edenborough (Nuffield Scholar 2014) gave her thoughts on minimising antibiotic usage and how the UK compares to other parts of the world. The final two speakers provided talks based on their own experiences. The first being of how an Avian Influenza outbreak can affect your business, your personal life and that of your staff, and how best to manage it (Brian Kenyon, Cherry Valley Foods Ltd). Dave Speller, Applied Group, then gave his account on the practicalities of running a fast growing innovative Broiler farming operation and consultancy business with his views on how the future may look. A great conference, well worth attending.